Could you tell from my last post how excited I am about this Lap Book/Unit Study? As I was printing the pages for my daughters' Lent Lap Books last week I started thinking how nice it would be to create a Papal Lap Book right now, during this special historic time in our Church. I mentioned it to my husband and quickly dismissed the idea since a quick google search didn't reveal much in the way of Lap Book resources and it would "take way too much work." However, it seemed that perhaps the Holy Spirit was prompting me to create this, since the very next day - the feast of the Chair of St. Peter - I had an unusual amount of "free time." I started with the cover and then the mini-books just started falling into place. I ended up spending most of the weekend finishing my documents and compiling a sample to share with you all. I am really looking forward to completing this unit study with my children, teaching them even more about our beautiful Catholic faith, the Primacy of Peter, and the Papal office!
. : Lap Book Supplies :. 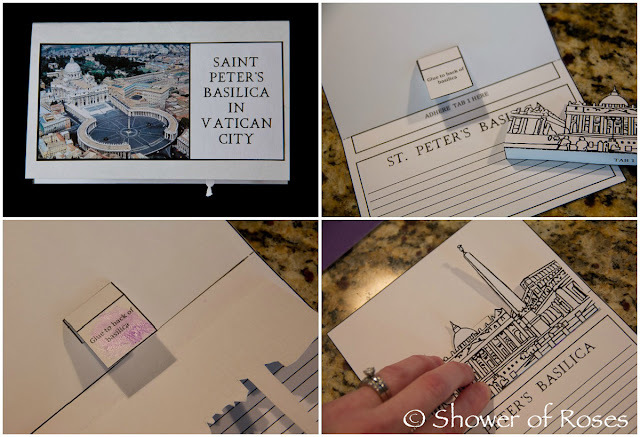 White Card Stock and Paper - 4 pieces per lap book, 2 to attach to the book, 1 on which to print the flag cover, and 1 more on which to print the St. Peter's Basilica Pop-Up. Red Ribbon - This is used to tie shut the "Who is the Pope?" mini-book. 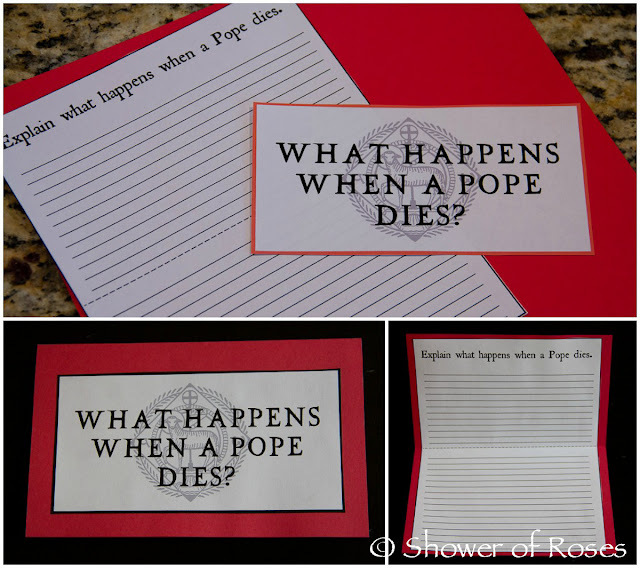 Optional: Red Paper and/or Card Stock (or color of choice) - We used red paper to accent "What Happens When A Pope Dies? 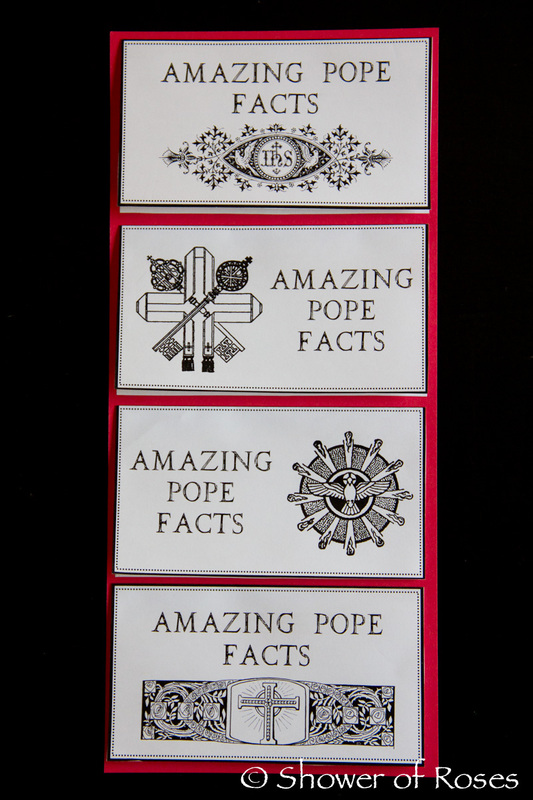 ", and red card stock for our "Amazing Pope Facts," "Selceting a New Pope," and "Some Special Popes." 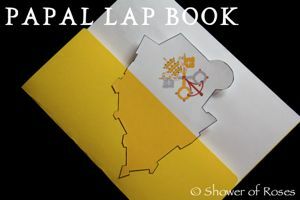 Download All Papal Lap Book Documents! Note: Thank you to everyone who has generously offered to pay me for the use of my documents and the time spent creating this Lap Book! My husband has been encouraging me to sell the Lap Book printables, but I know that there are many other families, like our own, struggling to keep up each month... I wanted to make sure that everyone has the opportunity to use this with their families if they would like to do so. Let's just say it is a gift of service and form of almsgiving for me this Lent, especially since we are not able to give very much financially at the moment. However, if some of you still feel inspired to perhaps "buy me a coffee" or send "some alms" our direction I've included a paypal button. I would be more than grateful and will put the funds towards filling our children's Easter Baskets this year! And everyone else, please just offer a prayer for my family! Thank you, and may God reward you! *All documents are printed on white paper, except where noted. 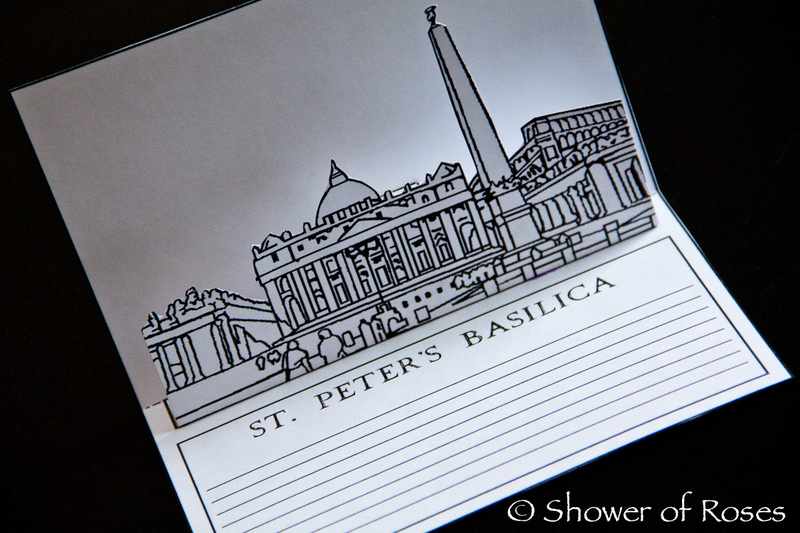 "St. Peter Pop-Up Cover Picture"
Here is also my brief study-guide/outline for completing this Unit Study & Lap Book. Additional Documents to go along with our Unit Study can be found here. For those that are new to creating Lap Books, you can watch a brief tutorial here on how to fold the file folder for a Basic Lap Book. 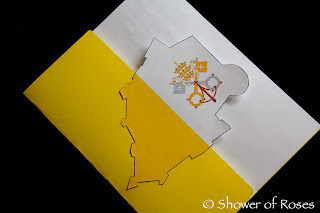 Since I wanted the cover of my book to look like the flag of Vatican City I then glued a piece of White Card Stock to the outside of the right yellow flap. 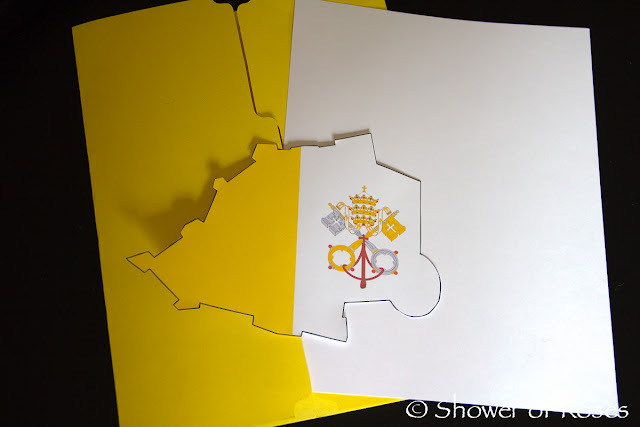 I then cut out the Vatican City Flag (shaped like the Country) and glued the yellow side to the left yellow flap as shown in the pictures. Since the White Card Stock is slightly shorter in length than the file folder I then trimmed the edges, so it lined up nicely. 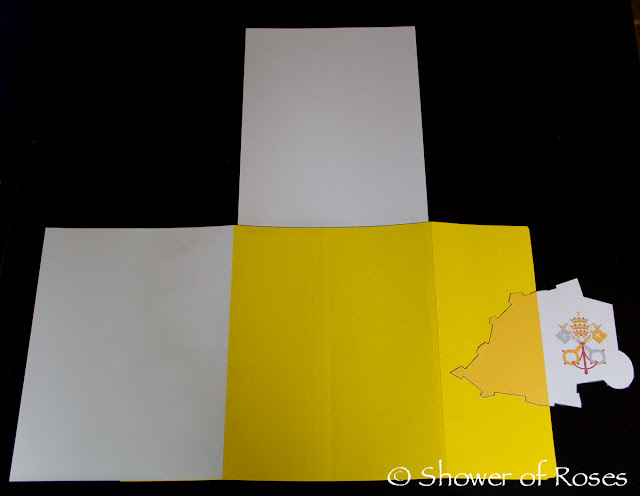 I also added a second piece of White Card Stock to the Center of the Lap Book to create an Extension Page. 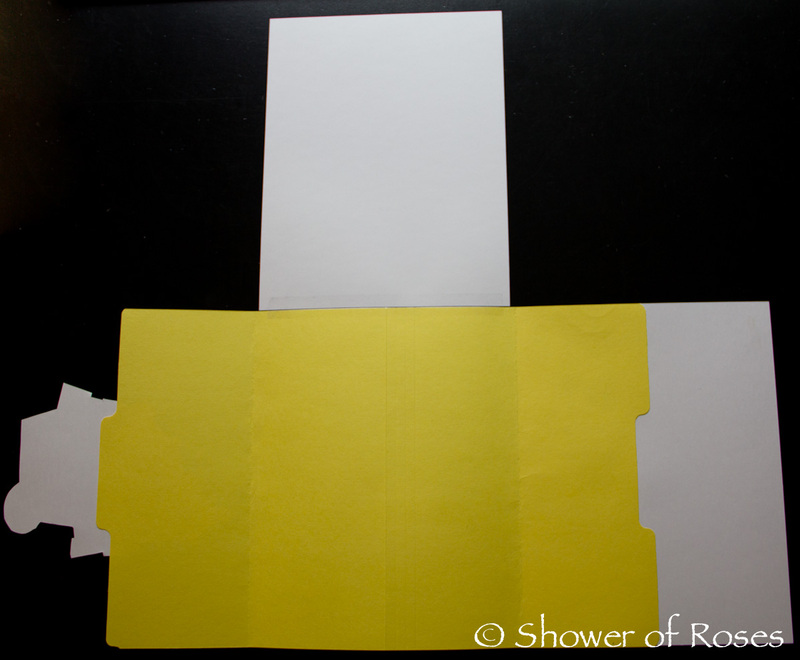 To do so tape both sides of the white card stock to the top center of the yellow file folder. let's move on to all the Mini Books!
. : First View - Behind Left Cover Flap :. 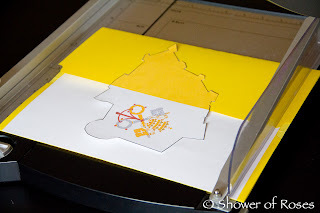 When you open the Left flap of the Lap book, the first thing you see is the optional Novena for Pope Benedict Layer Book glued to the White Cover Page (which is hidden behind the left yellow flap when the Lap Book is closed). This is an optional mini-book for those who have been praying the Novena. 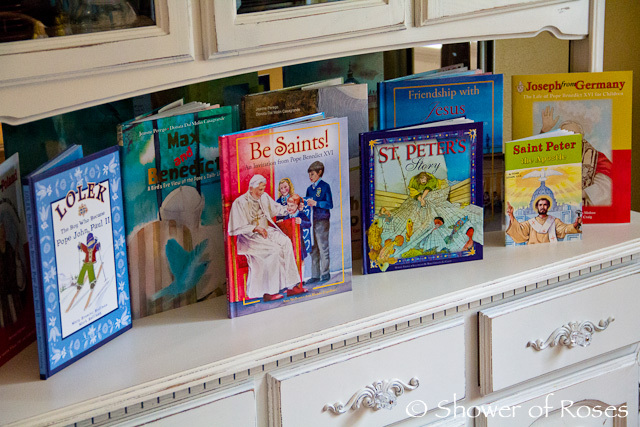 On the Left you see the Hierarchy of the Catholic Church Flap Book with Definitions taken from "My Catholic Faith." (Online link to The Hierarchy.) You can use the definitions I have provided, pasting them in or having the child copy them, or you can have them research and write their own.
.: Second View - Behind Right Cover Flap :. "Where does the Pope live?" 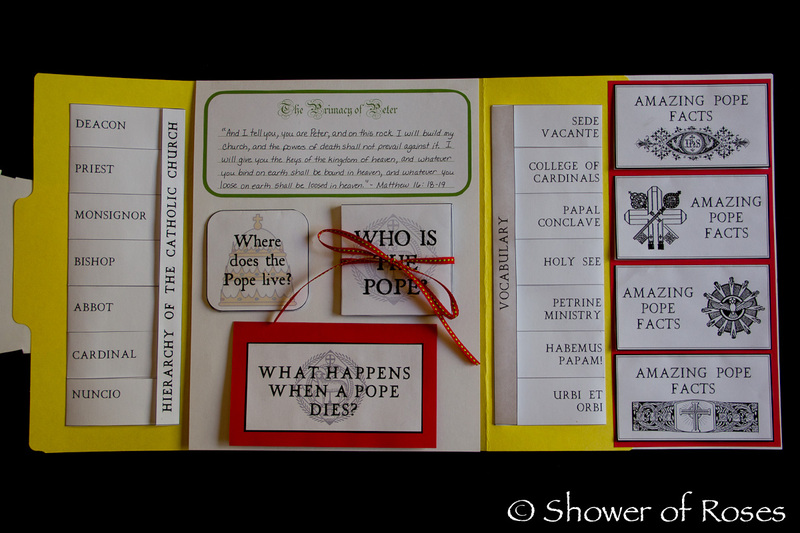 Trifold Book *Note: I originally intended this to be on the next page/swapped with "What Are the Chief Powers of the Pope" but mixed them up when assembling. It doesn't really matter, but I do think it goes better with the books on the other page. Copy Matthew 16:18-19 from the Bible. Copy or research and write your own text in the middle of this trifold book. This accordion book takes a little bit of assembly as shown, gluing each strip together before folding and adding it to the Lap Book. Wrap the book with a red ribbon before glueing it into place. This will keep the book closed when it is not in use. I've included a spot for the children to record the name of our next Pope and the date he is selected. 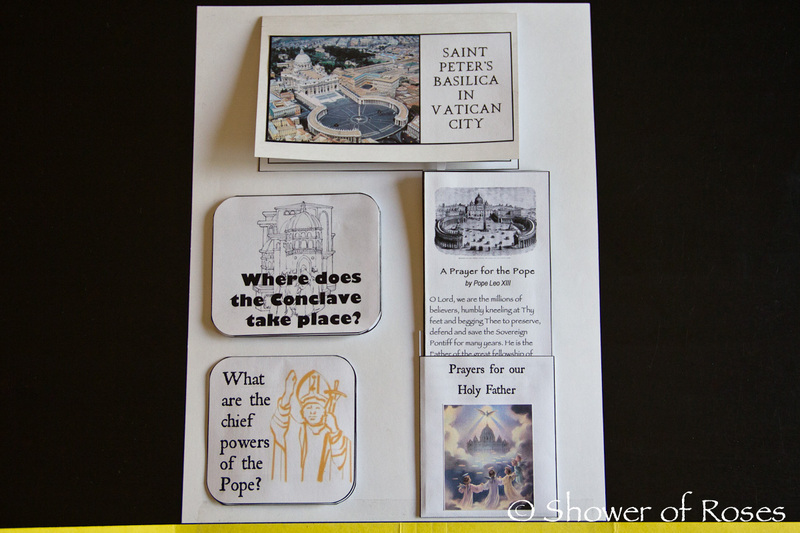 Fill these mini-books with various facts about past Popes of your choice.
.: Third View - Back of Center Flap :. 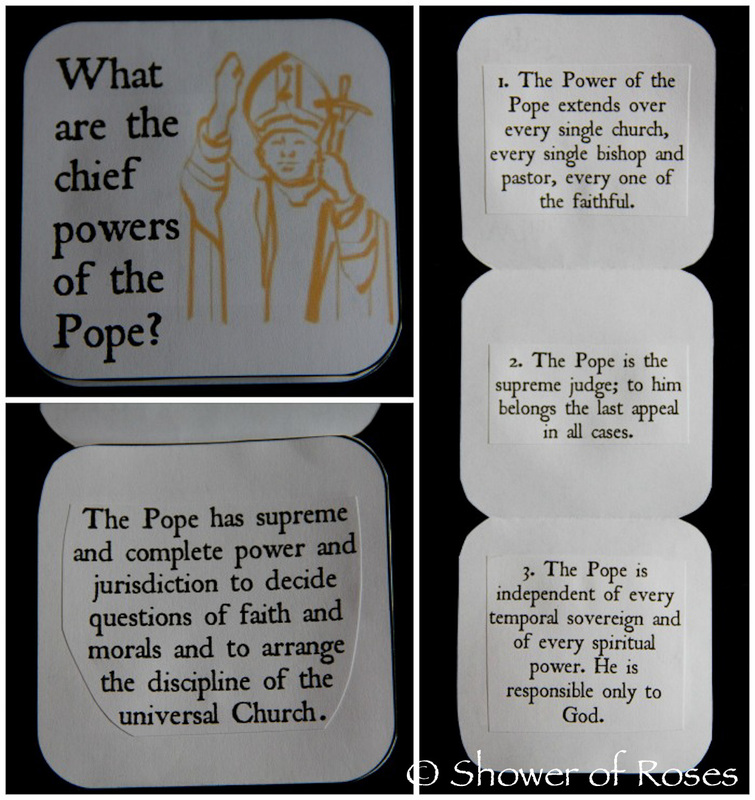 "St. Peter's Basilica" Pop-up Book (printed on cardstock) with "St. Peter Pop-Up Cover Picture"
"What are the chief powers of the Pope?" Trifold Book *Note: I originally intended this to be on the previous page/swapped with "Where does the Pope live" but mixed them up when assembling. It doesn't really matter, but I do think it goes better with the books on the other page. Where Does the Conclave take Place? 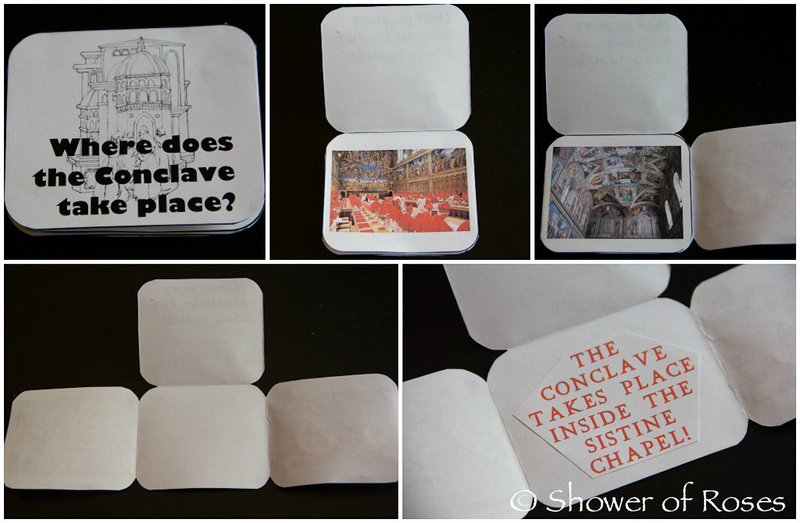 I did include a few pictures of the inside of the Sistine Chapel on this mini book. 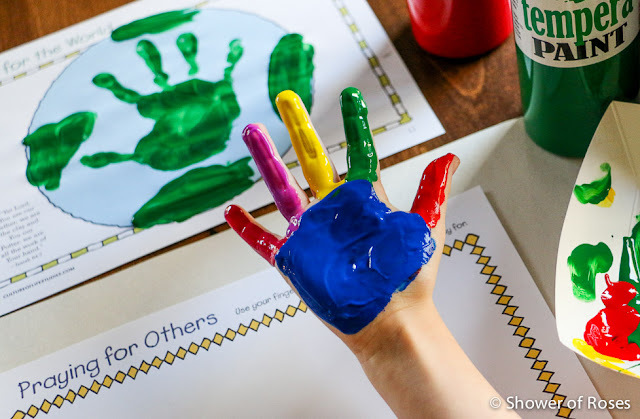 The younger children can copy or paste in the text provided, and my older children will be required to write a little about the Sistine Chapel. These answers came from "My Catholic Faith." Feel free to use them, or write in answers from the source of your choice. 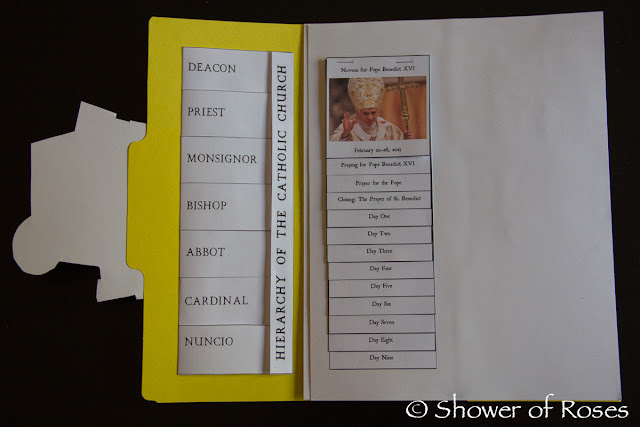 Assemble and use the pocket provided to store these prayer cards or additional cards of your choice.
.: Center of File Folder :. Research these topics and write a paragraph on each to include in this book. I chose some (of many!) 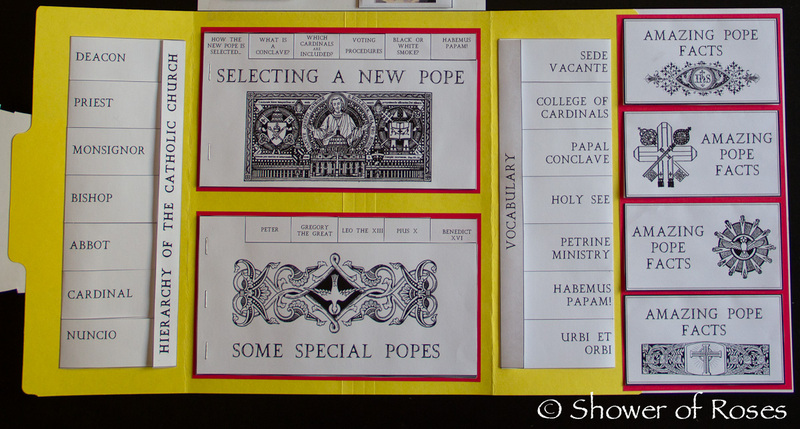 special popes for my children to research and write about for their Lap Books. They will each be asked to write a paragraph about St. Peter the First Pope, a paragraph about Pope Gregory the Great and the invention of Gregorian Chant, a paragraph about Pope Leo the XIII and how he wrote the prayer to St. Michael the Archangel (or they can copy the St. Michael prayer in Latin since they are working on memorizing it this year), a paragraph about Pope Pius X and how he lowered the age for children to receive their First Holy Communion, and either a summary about one of our many books about Pope Benedict (or a favorite quote or memory). I'm still trying to decide what we will attach to the back cover. 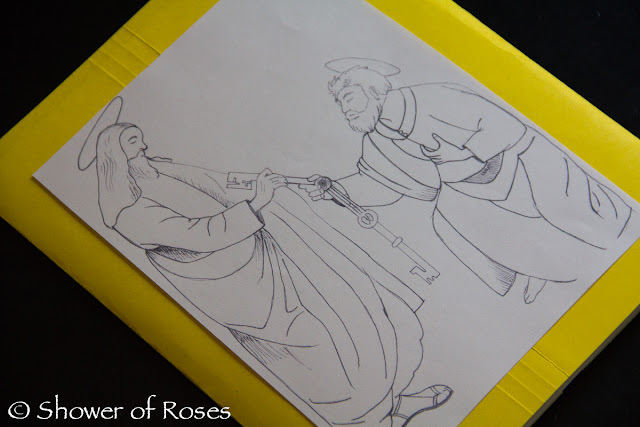 At this point I am leaning towards a coloring picture or an illustration, though it might be a perfect spot to put something about our new Papa once he is announced!
. : Full View of Opened Lap Book :. This is just one example of how this Lap Book could be assembled. 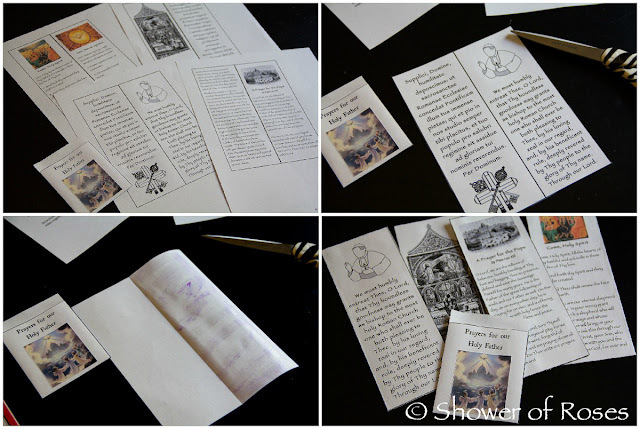 You can attach more Extensions, or create a Double Lap Book if you need more space, or for younger children you might just create the Basic Lap Book and include some of your favorite mini books. It's up to you!
. : Our Books and Other Resources :. Note: My husband grew up reading My Catholic Faith and introduced me to this book. I love it! If you don't already have it order a copy! 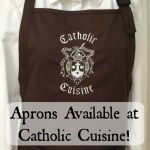 You can find My Catholic Faith Online here! We will be reading the chapters on The Primacy of Peter, The Bishop of Rome, The Hierarchy, Powers of the Pope, and The Papal Elections (scroll to bottom of page). And don't forget to Adopt a Cardinal! All of my children asked to choose their own. 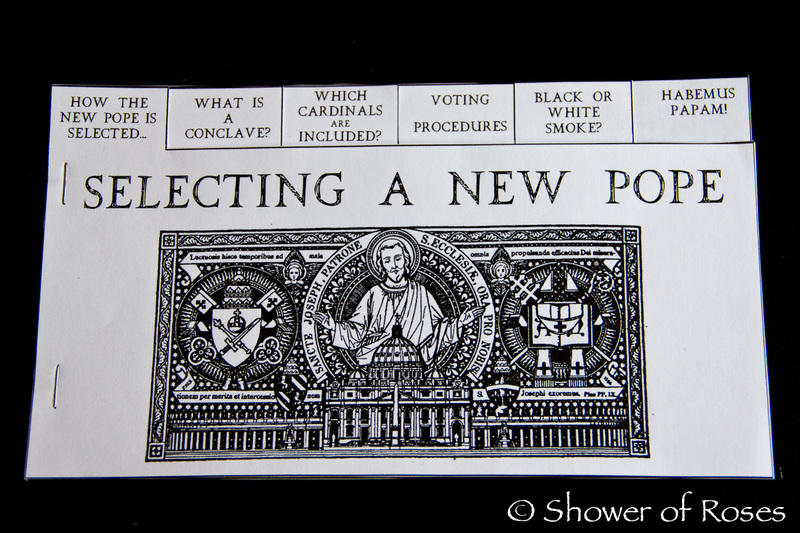 We printed out pictures of each of their adopted cardinals and they plan to pray for them each day, that the Holy Spirit will guide them during the Conclave, and then add them to their Lap Books following the election! If you have any questions feel free to ask them in the comment box and I will do my best to answer them as I have the time. If any of you do end up using the Lap Book with your children and post pictures, I'd love to see them! We most humbly entreat Thee, O Lord, that Thy boundless goodness may grant as bishop to the most holy Roman Church one who shall ever be both pleasing to Thee, by his loving zeal in our regard, and, by his beneficent rule, deeply revered by Thy people to the glory of Thy name. thank you for sharing. may the good lord reward your charity. i hope to print this off soon and let rose lead this study for the whole family. i am one of those families on a "twist tie budget" but i will be certain to have a mass said for your family. Perfect! Thank you so very much! I hope your family enjoys the Lap Book! This is absolutely beautiful!! I'm going crazy as it is but I may have to find time to do this with my kids. WOW! Thank you so much. I wish my children were just a bit older to be able to do this all together but I bet my 7 year old could do most of it. Wonderful! Thank you for making it available. Just amazing. Honestly I have had quite a bit of anxiety over including that Paypal button! Thank you for your kindness and generosity! I've never asked for anything for myself here before - other than all of my readers to use those Amazon links of mine ;) - and I haven't added sponsors either. But my husband had a big drop in his paychecks in January and his income is no longer enough to cover our full monthly home bills and groceries, let alone all the other expenses. For a few months now we have been trying to figure out where else we can cut back and if I need to find a job (with what time?!) or not. God always provides though, and sometimes from the most interesting of places! Anyways, I just want to say how much I appreciate all my visitors here, and your generosity and kindness to my family! Hahaha! Not exactly... I actually skipped most of high school, but in those teenage years of mine, before spending a year at College, I worked full time for a local Phone Directory. It was a small business owned by an older retired man who had been in the Newspaper and Phone Book Business his whole life. In those years I learned so much - from selling advertising, to learning how to design Ads, to compiling the white pages and classifieds, and even the distribution. For many years I was his only employee, hiring out some of the Graphic design. I loved it! When I was pregnant with our second I started my own phone book for another neighboring town/area and sold it a couple years later when I was pregnant with our 3rd, to be a stay at home momma at that time. 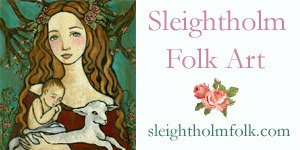 It was a lot of fun and I did miss it, and that is about the time that I started blogging! Also my husband was very supportive of this project and helped a TON over the last few days so that I could work on this, my next submission for Catholic Digest, and still get in a little time on the treadmill. Other than the boys going to Mass and a birthday party all of Friday we didn't have anything other than Confession and Mass planned for the weekend. I wish every weekend could be as relaxing! We are one of those families on a tight budget. But, I can at the very least buy you a cup of coffee and offer our rosary to you. I wish we could have that cup of coffee together! Thank you Elizabeth! My hubby's pay was cut by a large sum too this past January. It's been scary and yet so fruitful in other ways. God provides always, you are so very right on this. Thank you April, for your generosity and encouraging comment! I hope you and your family enjoy the Lap Book! God bless you and your family as well! I continue to be amazed at your generosity. God bless you for sharing your gift with all of us! This is just beautiful. I'm certain that our children will remember this papal election fondly because they were able to follow it so closely. God bless you and your beautiful family. It is very exciting, isn't it? Pope John Paul II was elected the year I was born, and so the only Papal Conclave I remember is Pope Benedict's! How exciting for your children to be able to experience this... Who knows, if we end up with a young Pope it could be many many years before the next Conclave! God bless you and your family too! I'm also going to have a Mass said for you and your family as my "thank you!!!!!!!" for offering this lapbook to your readers!!!!!!! THIS IS AMAZING!!!!!!!! GOD BLESS YOU AND YOUR FAMILY and I hope that your kids have a great time creating their lapbooks!!!!! Perfect! Thank you! I hope you and your daughter enjoy creating it too! You are truly a blessing! Thanks so much for offering this great lapbook. Last weekend I talked about this to my 3rd grade Sunday School class. This coming weekend I have the Deacon schedule to explain things better than I did. Now I will have more info for the kids to know what this is all about. You saved me a lot of researching! Thanks. I hope my donation helps you. Thank you so very much Tina! And I am very happy to hear that you will be able to use this with your Sunday School Class! Wonderful!!! You have such a generous spirit! I have gained so much from your creativity and your willingness to share and I am so glad that you have allowed me to show my appreciation by adding the "donation" option. I believe that I understand how difficult it probably was to add that option - but please know that you have shared and provided so much of your time and creativity - for me this is just a small way to say THANK YOU! Thank you for your kindness and generosity! It really is a relief to hear that you all don't think too badly of me for including that option. :) I hope you and your family enjoy the Lap Book! God bless! Okay, I totally commented on the wrong lapbook--not that the other wasn't wasn't amazing. My basic questions are would this be easy enough for your girls to complete and do you mind if I refer friends over to your blog for this lapbook? 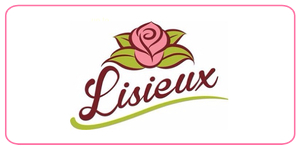 I will link directly to your blog. I wrote a much better comment on the boy's history lapbook post, by mistake. Pregnancy hormones are wreaking havoc on my mind!!!! I saw that and wondered if it was meant for this post! :) I made this Lap Book with all my children in mind and will just require varying degrees of work from each of them - the boys will need to write in more detail for some of the mini-books, the girls a little less, and the little ones (yes my 5 and 3 year olds don't want to be left out) will have a very simplified version. And please feel free to share a link to this post! I just ask that everyone links directly to the blog post and not to the documents on Scribd in case they need to be moved for some reason. Thank you for checking! Thanks for understanding. 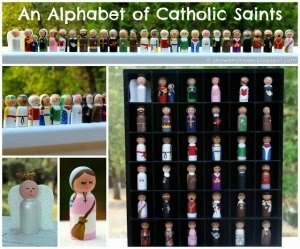 I think we will do this as a family project for Lent. By the way, I know that you feel badly asking for money, I understand that. That is why I never did well at direct sales. But, your resources are so valuable and well-done, I think that you are justified in selling them. You may want to see if something like Currclick would sell some of your lapbooks as a means of extra income. Thank you for all your work Jessica! You are truly an inspiration. I wanted to also let you know that I found a FREE online version of "My Catholic Faith" for your readers who are going to put together a lapbook and may not own that book. Let me know if you can't find it from this link and I can tell you how to get there. Once again, thank you so much. May God Bless You in all you do! Thank you Angela! 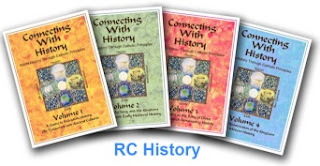 I included links to an online version of My Catholic Faith under my "Books and Resources" section - linking to each chapter - but I like that the link you shared is a little easier to navigate! I also posted a link to your lapbook on my blog. Thank you for this. I learned so much myself. Jessica this is really inspiring work, and I am happy to show my appreciation via a donation. There is nothing wrong with allowing people to financially support your hard work and creativity (in fact, I think you should consider keeping a donate button on your sidebar! ), and you provide so much incredible content for free and without ads or sponsors. It really is a blessing and a gift that you provide! Also, if you are interested, I remember you psosting your girls are Irish dancing! One of my daughters is a long-time Irish dancers and we have some beautiful Irish dancing stamps (in an unopened package) that I would love to pass along to you. My dancing daughter and her friends are teens and would love to have these go on to some younger dancers! Thank you Jana, for your kind comment and the gift! It is always such a blessing to hear from my blog visitors and to be reassured that the time I have spent online has not been wasted. And what an incredibly special day for your child to be born! I love it!! God bless you and your family! Thanks for your generosity. 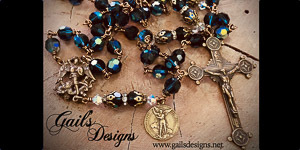 I will be including you and your family in my rosary. Perhaps another time I will be able to give a donation. May God bless you always. This is so amazing! Thank you Jessica for sharing your wonderful talents with us! God bless!! Thanks Amy! I sent you the files earlier... wanted to make sure that Godson of mine had a copy, though he might still be a little young for Lap Books! ;) He will be ready for them soon enough! Excellent! I'm so excited that so many of you are interested in using this with your families! :) And I hope you also enjoy the American History lists, we sure have been this past year! Thank you and God bless!! Thank you!!!!! what a fantastic resource!!!! Oh, I love this and will be using it with my 2nd grader... maybe my just-turned-five yr old could make one too as her very first lapbook! Thank you for sharing this... I am thinking maybe we need to drop most of our typical school plans this week and/or next to work on this and to just learn what we can in the midst of this exciting time... exciting yet sad, as I love Pope B16 so much!! What computer software did you use to make all these files? I would be pulling my hair out trying to do it in Word or something, LOL. We won't be able to drop most of our usual school - it's so much harder to keep up for the older children, but I do think we will postpone the Alphabet Path and some of our Geography studies to make time for this over the next few weeks. Can you believe that I only have Word for making my documents? I've missed my publishing programs so much (though it has been 8 years now and I probably would have to relearn how to use them anyways) but I have found ways to make Word work for me. I use a Mac computers and Word for Mac has a publishing layout setting that isn't too bad. I'm not sure if it is the same on the PC version or not. I was wondering what program you had used as well - I have a Mac and have had PC's in the past - will NEVER go back to a PC! I would love to do some "creating" of my own at some point and will have to look into the possible programs that people use/can use for such endeavors! In the meantime, keep them coming, Jessica!!!! Your work and creativity are truly gifts from God!! THANK YOU! Thank you! I will have to look into PowerPoint, I've never used it before! Wow are an amazing, beautiful person! I too thought about creating some sort of booklet for my children to put together as we all witness together this historic moment in the Church - but this is way better than anything I could have done! You have a beautiful talent! As far as the paypal button, I am glad that you added one! There are many times I print your documents or use your craft ideas and feel guilty in doing so. This will allow me to reward you for all your hard work and time. I currently have been blessed with only 5 children, but between appointments, homeschooling, music lessons, baby, cooking, cleaning, and everything else I struggle to keep up so your energy and creativity simply amaze and inspire me!!! Please accept my small donation given with heartfelt gratitude! May God richly bless you and your beautiful family!!! I love how you said "only 5 children" - that is what I would tell people growing up "Oh, i want a small family... only 5 children!" God had other plans for us, and I am so glad we were/are open to His plans. I just couldn't imagine our life without "Rose" and "Bud" and I am sure I will feel the same about any more children He sends us. Thank you so much for your kind comments and your generosity! This is GORGEOUS, Jessica! :) Thank you for the hard work you've put into it. 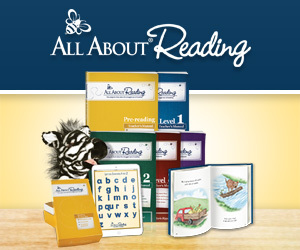 :) Would you recommend this for 6 year olds though, who aren't so fluent in reading yet? We've NEVER done lapbooks before, even if we use Five In A Row sometimes for our lessons! (Yep, lazy mama here!) But I am inspired to try because of your post! Thank you Tina! Yes, I do think younger children could make at least a simplified version of this, with help. My 5 year old and my 3 year old are each making their own. I have made a couple modifications for them (a traceable quote for "The Primacy of Peter" copywork mini-book, and will probably continue to modify as we go along. I will try and share updates with you all as I have the time. I usually don't post our projects before I have completed them with the kids, so I am still figuring out the details. Thank you! God has gifted you! I did send something your way (God provides; I just sold a book and had something in the paypal account) as I would have paid someone else if there was anything this good out there to purchase. Looking at everything I am printing, I am going to learn a lot with my children. Thank you so much for your generosity. And thank you to your family for allowing you the time to do this for me! Oh, I know how hard it can be in construction - my Dad is a Contractor/Electrician and growing up we had some very very difficult years, but God always provided for my parents and all 12 of us kids! And I am the same way... Had I found this online I would have sold a book to pay for it! lol Thank you! I hope you enjoy it! This is so beautiful and I am very moved by all the kind comments. My husband was laid off last June and has a new job that he does not like as much-and these comments helped me be more courageous and positive about it. In the world of online comments which are often so mean, this is like heaven. I love the lap book. Praying for our current and new Pope who is coming soon. Thank you! I, too, have been so moved by the comments! I am so very blessed to have such wonderful visitors here at Shower of Roses! God bless you all! I think it's great how you are offering this for free for those that are not able to pay. I've been in those shoes before as well so it's greatly appreciated. However, we've been tremendously blessed lately so I hope my donation covers many others who are struggling at this time. God bless you for your beautiful book, this will be my first lap book ever and I am SO enthralled by it. You did a really great job with it! Thank you so very much for your kind words and generosity! May God reward you abundantly! I hope that you enjoy the lap book! This will be the first one for my younger children too! Jessica, your talents amaze me continually. I am more than happy to pay you for all the work you put into this and everything else you so freely share. You have blessed my family time and time again. God bless you!!! Thank you Lisa! I too have been blessed by the talents of others... It is so great that we can all share them with each other online! God bless you and your family too! Thank you, dear, for sharing! And, most especially, for letting us bless you with a "coffee" or two! I always felt like I was "stealing" your plans and ideas, but now I feel a little better helping pay a little for them. Thank you for allowing us to be a blessing to you through that donation button! You are such a blessing, inspiration, and encouragement for all of us mothers teaching our children the beauty and JOY of living our Catholic faith. Thanks! I just love that you all are excited about this too! I really enjoyed putting it together! Thank you so much for this!! 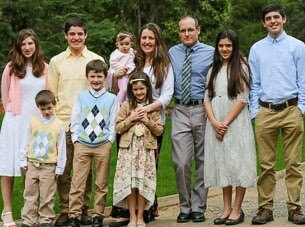 You really should have a "how to" homeschool reality show on EWTN! I wouldn't miss an episode. God bless you for your willingness to share. I honestly don't know if I'd still be homeschooling if it wasn't for your blog. You're such an inspiration!!!! Maybe I should... then you all can see first hand all the areas in which I struggle on a daily basis! ;) Believe me I have plenty of faults and challenges just like anyone else. I'm so glad to hear that my blog has been an encouragement to you with homeschooling. Homeschooling is so very challenging and definitely lots of work, but it is also so incredibly rewarding at the same time! God bless! I have never done a lap book with my children, nor have I seen one done- so I was just wondering about how long/day you spend on these? Also, how long does the process take? 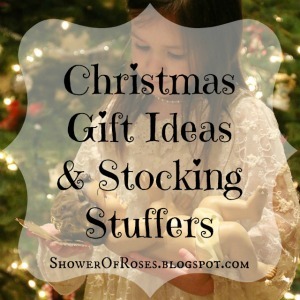 I would love to do this with my bunch, but I am so intimidated by crafts....I know, my children are deprived! Your blog is such a ministry, thank you so much. Jessica! 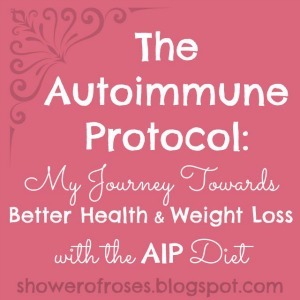 Your lapbook is amazing and I am seeing all over the internet!!... beautiful work! This is lovely and very well done. I'd like to use it, but don't have a facebook account. Is there another way to be able to print the pages? Thank you so very much. Thank you! I only have a minute, as we are getting ready to head out the door for the girls Irish Dance class at our parish, but I wanted to let you know that you don't need a Facebook account to log into Scribd. My Scribd account is not linked to Facebook either. When you click the button to sign in (or create account) right under the Facebook button you should see the area to "Sign up without Facebook." Enter your email address in the first box. (Every Scribd account must have a unique email address. This is the address to which they send any notifications and password reset emails.) Choose a username and enter it in the second box. Choose a password and enter it in the third box. Click the Sign Up button. If you still have trouble, send me a direct email toL jessica(dot)showerofroses(at)gmail(dot)com and I will forward you all the documents tonight. These lap books are amazing. I look forward to when my children are old enough to do this! I do have a question on books for you. I have seen you post some recommendations on good reads for yourself but haven't written them down. Would you be willing to add an adult section for your book list? 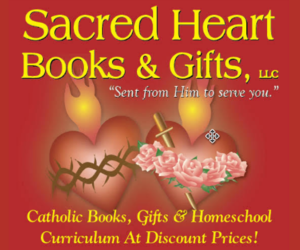 Homeschool, catholic, fiction, nonfiction, inspirational, etc...thanks! This lap book is amazing! I was thinking about trying to put one together but had no idea where to start! What a blessing you are with your amazing resources you provide! I love that you put a pay pal button! I can't wait to put it together! My kids will love it! Thank you so much! :) I hope you enjoy making it with your children! This is incredible! Thank you for your amazing work. Thank you. This is SO AMAZINGLY BEAUTIFUL!!! 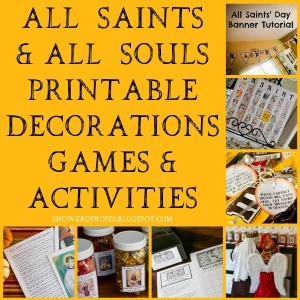 I wish I had time to do this activity with my 1st Communion class...I will at least share your blog with the parents, who then (hopefully) can! Just saw your donation button...wonderful!! Oh, Jessica, this looks wonderful!! I am so excited. I am really looking forward to doing this with my kids! And thanks for posting the link for "adopting a Cardinal" during this time. What a neat idea! And I also meant to add - thank you for adding the donate button. I really appreciate all you do and all you share with us out here in blog-land, and I appreciate the opportunity to help out a little bit! Thank you! Isn't the Adopt a Cardinal website such a great idea! They ALL need prayers so very much, not just the ones we would choose to pray for. I hope you enjoy creating the Lap Book with your children! I am absolutely overwhelmed with gratitude to you for sharing--so generously---your time and talents with moms like me!! THANK YOU!! ....and may God Bless YOU and your beautiful family abundantly!!! Thank you for the charity you show with each and every post you share. Our family has been blessed and inspired by your kindness and gifts. I am so excited to begin the Unit study with our children and more than happy to provide a monetary token of appreciation. We will keep you and your family in our prayers. Thank you so much, Elizabeth, for your generosity and for the prayers! I hope you enjoy the unit study! My children are a bit young for the lap book but I wanted to donate anyway. My husband is in the military and the frequent moving often leaves me lonely. Reading your blog is like visiting with a friend. It brings me great comfort. Oh and before I started reading I was frightened of homeschooling, now I can't wait. God bless you all for your generosity! I feel the same way about a few of the blogs I read, even though we don't ever move. It is so nice to have such a caring and supportive group of friends online! :) And homeschooling is such a blessing, you will love it! I just wanted to thank you for your wonderful work! This is an incredible layout and so well put together. We will be getting together with other families to form a mini co-op to work on this unit study. I did send a small donation, but feel like it is worth so much more!! Sending prayers your way as well. God Bless. Thank you so much! I'm glad you like the Lap Book and love that you will be doing it in a co-op setting! How fun! Good idea! I was just showing my children the original painting online today! I am eternally grateful for all you have done for us, your Catholic family. Our souls are thankful too. 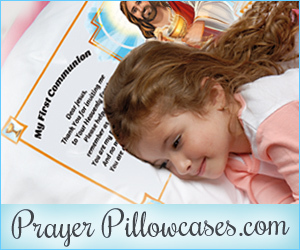 You provide all of us with tools to raise our children in the faith and help us be holy. This document is breathtaking and beautifully put together. It will be a keepsake my children will treasure. You have inspired me so many times to keep going and continue to celebrate the liturgical year. As of late, you have even inspired me to get back onto the treadmill. I am more than happy, willing, grateful, jumping at the chance to compensate you for all of your hardwork. May God bless you and continue to provide for you, even in the most unexpected of ways! Thank you so very much Prudence! God bless you and your family too! So how did your kids decide which cardinals to "adopt," I am curious?? My kids chose some and I just used the random generator! We actually used the random generator for each of us. Each of the children said a prayer after we put in their name and before they pushed the generate button. It only let us choose names for 5 of us before saying we hit the limit for the email address. So the remaining three of us used my husbands/family email address. :) It was really fun to see who each child was given, and they are all researching and talking about "their" cardinal! Mine wanted to choose one themselves, so I read all the American ones to my five yr old (who chose Cardinal George) and then my seven year old looked on the list and picked the one from Austria (because they saw The Sound of Music over Christmas and are obsessed with it now, ha! In fact, so obsessed that I used many ideas from your Favorite Things b-day theme for one of their birthdays in January - thank you for shraing your ideas on that! Now if I could only find time to put photos of it on my blog!). My husband and I used the random generator though! They think it is neat to have photos of their cardinals hanging near the dinner table so we can remember to pray for them. Thank you! I'd never even heard of lapbooks before today, and I'm so excited to make these for my two oldest kids. We're even going to do the novena a bit late, since I'm sure Josef Ratzinger will still need our prayers as he continues to serve God in his new role. I hope you continue to share these, as I'm happy to donate for such quality materials to use with my kids. Thank you so much! We have been making Lap Books for years now and my children really love them. If you are interested you can find the links to some of our past Lap Books here. I'm so happy you've received so many thank-yous and great responses to this lapbook! As for me, I was so very excited to see the instructions arrive in my email!!!! My dd and I have assembled the whole thing today...just a few more bits of research to finish it! I am truely grateful for all the work you put into it (thank you for listening to your hubby about the paypal link...you deserve it)...and we're learning so much, thanks to you! Dear Jessica, I don't know if you got my other two comments and I don't even know where I wrote them! 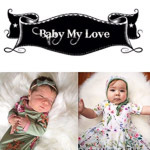 But I want you to know that you have change my life so much in the past few months giving yourself so much in this beautiful blog... its a great inspiration for mothers like me! and this lap book is the best thing ever and the most apt for the moment!Thank you so much. My husband and I are theology students and we have two lovely children called Elijah and Ann. THey all know you and your blog:) God Bless! 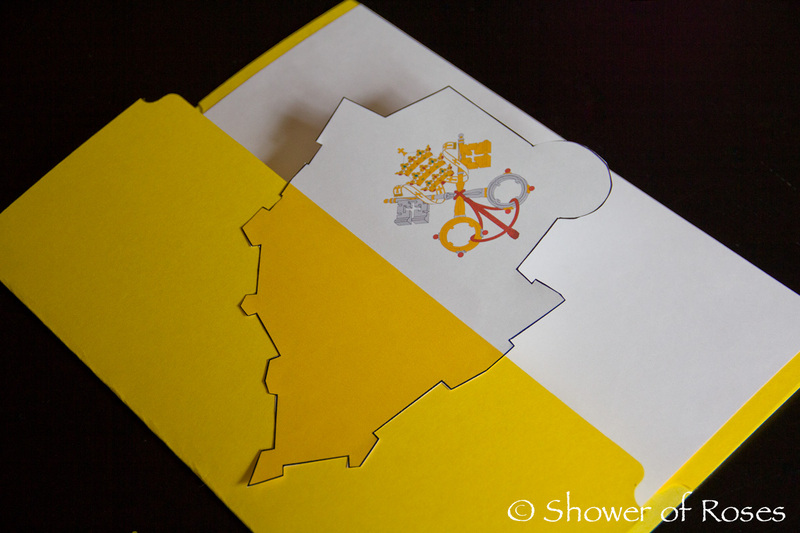 Thank you so much for creating this beautiful papal lapbook! Thank you for allowing me to send a little something your way for all of your effort! I do have a question. 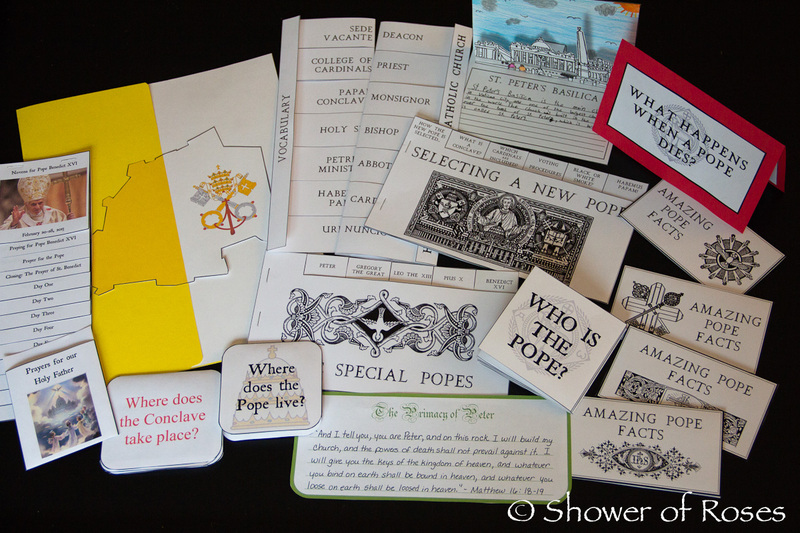 Under Unit Two of the overview page, it lists "What does a Pope do?" but I can't seem to find it on scribd. God bless you for your continuing inspiration over the past two years that I have followed your blog. I wish we lived closer, as my three youngest (12, 10 and 4) would really love to know your children, and I would love to know you "in person!" Thank you so much! I am just popping in for a second, to answer your question, Sherri. :) It looks like that is another typo on that Overview Page. I really should have known better than to try and compile that at 3am before publishing this post. By that time I just needed to finish it! ;) In my original plans I did have a mini-book titled "What does the Pope do?" but I ended up replacing it with "What are the Chief Powers of the Pope?' yet is somehow managed to get included in that document. I will try and upload another revision (I already changed "Days" to "Units" in my first revision...) I am sure some of you may find another error or too. Do let me know and I can upload the corrections. And I am sorry for the confusion! Dear Jessica, now that I see that my comment has been published I am really excited and I want to let you know what in your blog has been so inspirational and something about myself. I am living in Austria and studying theology. For the past three years I have been home and my husband has been studying. Anyways My Elijah is soon going to be 7 and is going to the local school here but I am partly homeschooling him. So all the ideas that you put up here with books and lapbooks is very helpful. And all the tips and recipes and above all the open heartedness with which you share everything with all of us is truly outstanding!! Thank you so much for this! We are looking forward to putting this together! Prayers to your family. Jessica, This is absolutely wonderful!! You did a great job!!! You have an awesome talent! 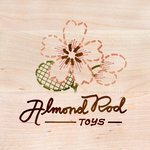 And thanks for adding my smoke craft to your list, too! May God Bless you and your family. Jessica, I have only commented once before, but I've been faithfully following your blog for a few years. We are a military family who just moved back to the states from Japan because of a life changing event -- my husband was diagnosed with a very large brain tumor and has been in the hospital for the last six months. Thankfully, he is on the road to recovery and should be home soon. I'm thankful for the gift of our faith, for liturgical celebrations, and the routines my kids and I have stuck to that have kept us close to our Lord during these trying times. As a convert, I've learned so much from your blog and have started celebrating the liturgical year at home because of it. 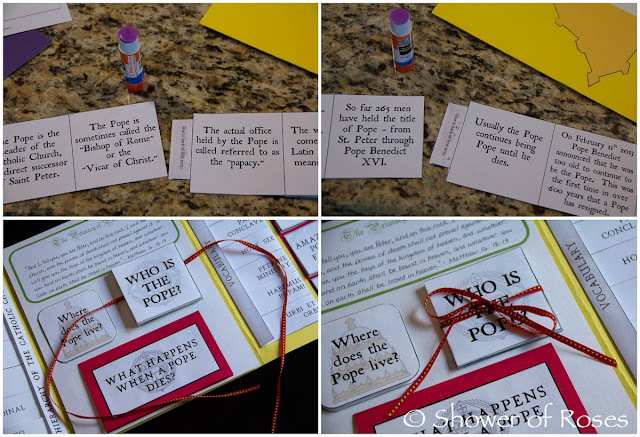 I look forward to using your papal lesson plan to do a study with my kiddos (who are 15, 13 and 10) and will have fun doing the lapbook with my youngest two. I'm sure I'll learn SO much as we do it too! :) I'm grateful for all that you share, (this lapbook is a prime example) and I'm glad to have the opportunity to give you a small token of appreciation - thank you for allowing me to donate as a way to say thanks! Even so, I did make a small donation to you. You have worked hard and deserve some payment even if it is only small. If everyone who uses your services were to pay you a little bit, that should add up to enough to cover a few more of your bills. As my friend, Jessica W. says, "God always provides . . . just not any extras." 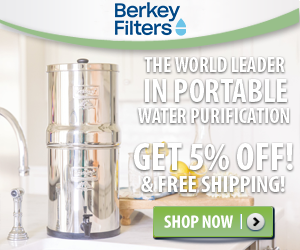 Jessica: just another "thank you" for providing such a fantastic resource! And thank you for providing a way for us to compensate you. My sporadic Amazon purchases just don't seem like enough, given all the benefit my family receives from your blog!! Glad to be able to pay for the lapbook. 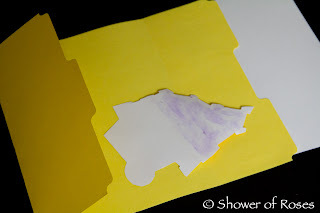 An idea for some moms who may want to do a "lite" version of a lapbook: I sometimes do all-family lapbooks by using a posterboard instead of multiple file folders. We choose which of the components we can do, given limited time/energy of whatever season of life we are in. This worked really well for the Olympics this past summer (just after I gave birth to #5), since we could keep track of medals as a family on the poster board. Just a thought. It helps me when I feel "too busy" but still really want to do SOMETHING extra and special. Jessica, I can't begin to undertake such a beautiful lapbook for our first attempt, but I donated anyway because you really deserve a mocha with whipped cream for this project. It's stunning, and the kids who are lucky enough to do it are going to learn a lot and remember this time period very well. Thanks for all you do for homeschoolers! I really love the lapbook but I can't download on scibd on my I pad. When I hit download it just spins but never downloads. Our computer crashed so all I have is the iPad. I Wouls be willing to purchase this lapbook but can't download it. Any suggestions? Jessica, I'm a convert to the Catholic Church so I'm always learning new things about the faith. I'm also a young, newlywed with no children at the moment, but I wanted to say that your crafts are great for any age! It is my hope to have as much knowledge about the faith as you do, so that my future children can also follow in my footsteps. I love your blog, thanks for the facts and inspiration. Thank you for sharing your lap book. I used it this week with my faculty. 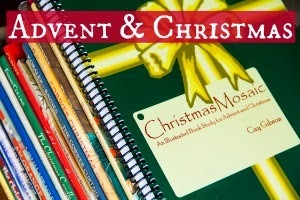 Now every classroom has a lap book to share and have for the students. The 3rd grade used parts of it for their lesson on the Pope yesterday. It is wonderful-go to my facebook page so that you can see the pictures (Holy Rosary Catholic School - http://www.facebook.com/hrsantioch . Thank you. Thank you so much for sharing the link to the pictures! I just love that you used this in a classroom setting! Everyone did a great job! This is great! My kids are loving it! Between this and some Lenten activities, we may never do "real school" again. :P I don't have the book "My Catholic Faith," but I really want it now!!!! Can you help me out with some suggestions for things you might put in the Amazing Pope Facts flip books. The things we are finding in our resources are fitting better in other spots. Any help would be awesome! I am so thankful to have found this. Things have been totally crazy here, too, but this will probably be the only time this happens while my older girls are still in school and I want them to understand what is going on! Amazing Facts - The ebook Who is the Pope? had a few suggestions on the last page. 1. Which Pope was the Pope the longest? 2. Which Pope was the Pope the shortest? I'm also planning on reading the section from My Catholic Faith on Infallibility of the Church! Perhaps having them answer What is meant by the infallibility of the Catholic Church? And/Or: Has the Church in fact proved itself infallible? 1. It is a historical fact that not one Pope, whatever he was in his private life, has ever taught error. 2. True, some high rulers of the Church have gravely sinned. Nevertheless, enemies of the Church have exaggerated even the lack of impeccability. In the long line of Popes the vast majority led virtuous lives. Many of them are honored as Saints and martyrs. The enemies of the Church can bring charges against only five or six Popes: Most of the charges are calumnies or exaggerations. But even if the charges were true, they prove nothing against infallibility. 3. The Church cannot change its teachings on faith and morals. But it may restate the doctrines more clearly and completely. Year after year the Church proclaims the same unchanging doctrines. Her doctrines need no reform, for they are of Divine origin, the work of the Incarnate God. Quite a bit of this information would be great to include in those Amazing Pope Fact Books! I hope this helps! This is amazing! The boys and i are going to love putting this together and learning. I think I will print out and put pictures of them in these places from our trip to Rome. Or we will wait until the new pope is announced and we have a picture of our new pope! Great ideas! How awesome that you have all been to Rome! My husband has been, but someday we'd sure love to go as a family! Thank you for the lapbook. My wife and i are putting several together for all the "old folks" we see at daily Mass. (One of the benefits of retirement.) However, I have one question. What is your source for the "Hierarchy of the Catholic Church" listing? Any explanation would be appreciated. Thanks again for all your work. 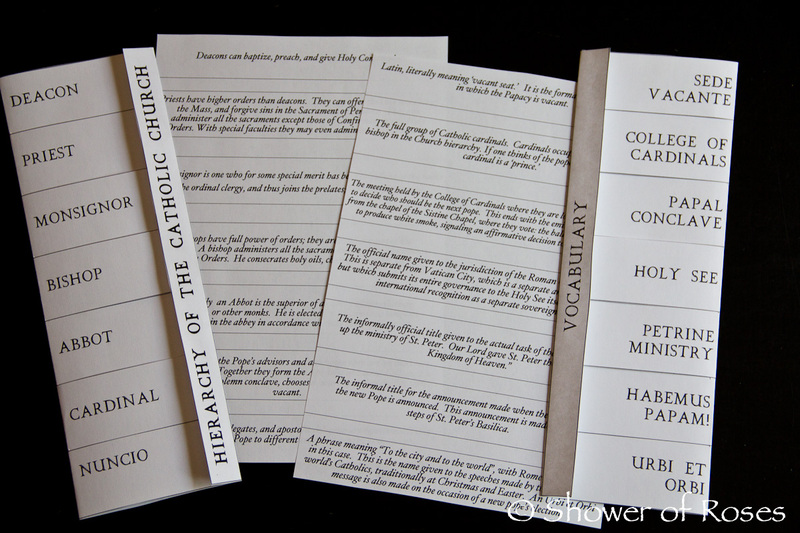 When I was creating some of the mini-books for this Lap Book, including the "Heirarchy" vocabulary book, I used my old copy of "My Catholic Faith." You can actually read this particular chapter online here. Hope that helps! And I love that you and your wife are creating a copy to share at Mass! God bless you both! The explanation in "My Catholic Faith" of how the hierarchy differ in the power of jurisdiction and the power of orders is exactly what I needed. Thanks for your research. For those who are "late" to doing the Pope Benedict Novena (like myself), perhaps you could provide something similiar for our Cardinals--currently discerning their choice for next Pope? Again---- I am extremely grateful to you, Jessica, for sharing your time/talents so generously with people like me who are SO technologically challenged it's embarrassing!!! God Bless!!! A big thank you! The papal lapbook is wonderful. 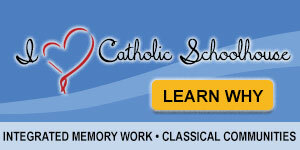 I had to share it with our whole Catholic homeschool group - and everyone thought it was great! We all appreciate all of your work!!! Thank you SO MUCH, Jessica! A thought just occurred to me that would be interesting to add to this Unit Study: How the Pope chooses symbols to place on his Papal Coat of Arms! I was watching EWTN & it was interesting to hear Pope Benedict's symbolic choice of a bear... I was also reading in "Lolek" the suggestion for the children to make a "Family Coat of Arms" placing pictures that represent their family's interests. Just a thought I'd share with you and your readers. I'm SO sorry that you are not feeling well. Be assured of our family's prayers for you!!!!!!! And may God bless you abundantly, Jessica!!! P.S. I just HAVE to reiterate: this is THEE BEST LAPBOOK project EVER, JESSICA!!!!! I am absolutely in awe of your artistic & technological talent & simply cannot THANK YOU enough for providing such exciting tools to help aid us in teaching & learning our faith! What a GIFT you are to us AND our children!!! I feel so heavyhearted because our family is facing the sequestration & we simply cannot afford to send you a donation at this time. However, please accept my family's spiritual compensation: A mass, rosary & holy hour offering for you and your family in gratitude to God for your kindness & generosity. I look forward to the day when a financial compensation can be sent to you as soon as we are able. Praying you feel well again soon!!! Great ideas, thank you! And thank you for the complements! I am so glad you are enjoying the Lap Book! Please don't feel bad about not being able to donate. Our family will also be faced with even more financial challenges with the sequestration actually happening... We are waiting to hear how many hours my husband will be cut... :( So, I understand completely!! This is exactly why I made it optional and available to all. The prayers are more than enough and greatly appreciated! Also, I just uploaded the option for the Novena to the Holy Spirit for the Conclave! (using the Novena from Pray More Novenas) I actually think this is the one that I'll have my children place in their Lap Books. I included a spot for them to paste in a picture of the cardinal they "adopted" and are currently praying for as well. Thank you for sharing your hard work with all of us. We are brand new to using lap books. This one is beautiful and so timely! We have stopped all other school work for a short time so that we can learn about what is going on in our church at this time. And I might say we are having a great time learning this way. 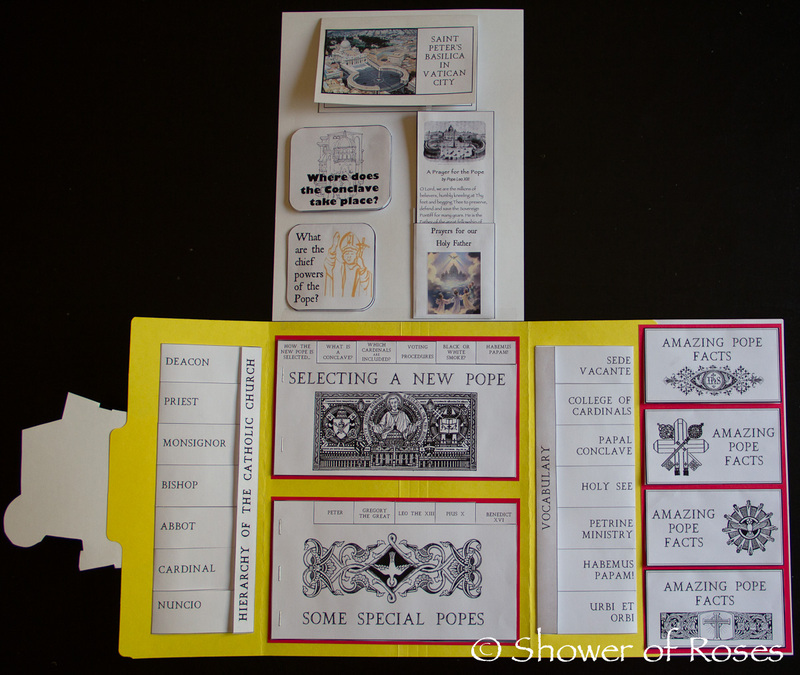 We subscribe to our local newspaper and I am going to try to add an extra pocket to keep clippings that we find about Pope Benedict and the pope that comes to us next. Jessica, This is so impressive. I linked to it from my latest post on Matthew 16 and the papal conclave for kids http://contemplativehomeschool.wordpress.com/2013/03/04/matthew-16-and-the-papal-conclave-for-kids/. 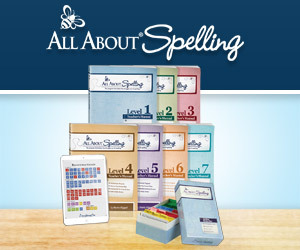 Could you tell me what software you use to make your printouts? Thanks! This is so incredible! Thank you, thank you, thank you! I am not homeschooling this year and am really struggling with ways to make sure that my children get the Catholic education that I so desire for them. You really helped me with that today. I will be checking out your blog much more in depth. I hope you like it...and thanks again for ALL the work that you do! Thank you for this. I'm not sure how to download and print though, any suggestions? A box to Log in to Facebook comes up & I don't have a facebook page. Hi Cindy, you actually don't need a Facebook account to log into Scribd. My Scribd account is not linked to Facebook either. When you click the button to sign in (or create account) right under the Facebook button you should see the area to "Sign up without Facebook." If you still have trouble, send me a direct email toL jessica(dot)showerofroses(at)gmail(dot)com and I will forward you all the documents. Thank you so much for all your work on this lapbook! 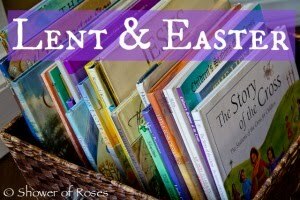 I'm a new homeschooler to a 3rd and 1st grader (plus a toddler) this year and a Catholic convert, so everything has been very informative for all of us! 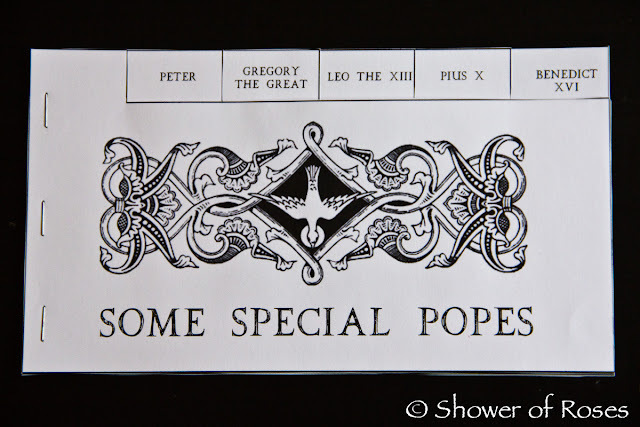 We finished the first unit today and I'm having trouble finding kid-friendly info about the special popes online. Do you have any references for those to share? You motivated me to finish my post/summary for our 2nd Unit! :) And you even found it before I had a chance to come back and leave you the link. Hope that helps! Oh, I'm so glad! I finally finished printing all the unit 2 materials. My printer decided that it will jam after each page, so I'm still sitting here at 1 am, but it will be ready for tomorrow. I love the fill-in-the-blank Pope pages. At first I thought I'd just give those to my 1st grader, but I suspect my 3rd grader will learn a lot more hunting down those answers too. I'm hoping to get through the units by March 15th when we stop for spring break (and maybe the Conclave will be going by then? ), so cutting down the writing a bit will help. We'll be starting the Conclave Novena tomorrow. The boys will get a kick out of adopting a Cardinal! Originally I misread the supplies and assumed I needed white file folders. I was amazed at the lack of white ones. Getting colors was easy but neither OfficeMax nor the education store (that does sell file folder games) sold white folders. So I'm glad I don't actually need them! You are a constant inspiration! I am constantly amazed at your energy and creativity. Your blog has brought so much comfort, joy, and inspiration to me and my family. Thank you so much. I can't wait to use this lap book! We are very excited. 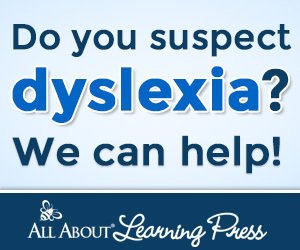 I've shared the link to this page with my homeschool group as well! I hope that my small donation can help. You have done so much for this community! Thank you so much for this awesome resource. Well worth a donation! I was wishing for something like this as soon as Benedict XVI made his announcement. What a blessing! Thanks, Jessica! And thanks for your generosity in offering this free for those unable to afford to pay. I have definitely been in that situation many times, and I am always grateful. God bless you. Thank you, Jessica, for all your hard creative work putting this together. I'm finishing it up today as the conclave begins. Such an historic moment in the Church and I'm glad to have this little project to help remember it. It'll help the kids learn and understand the whole process better. God bless you! I printed it smaller so it would fit in our book. This is an excellent resource Christine! Thanks for sharing!! Thank you Jessica so much for the BEAUTIFUL work you did on this lap book. This will be our fist lap book, and how wonderful and exciting to be doing it on such a special and important topic! I was so glad to hear this could be done with younger children too. 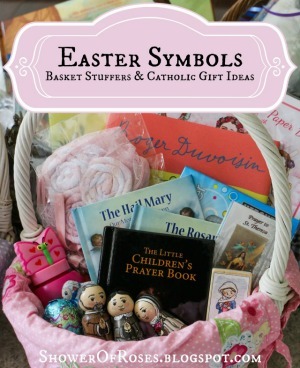 My oldest is turning 4 (on Holy Thursday) and I think she will really enjoy this. I am very happy to make a small donation. I have been following you since right before Advent, and I can't tell you how much more fruitful an Advent we had and now Lent we are having thanks to all the wonderful things you have shared. I was also excited when I learned you were the sister-in-law to one of the priests we were blessed to have at our parish for two years..hehehe. Getting to take a peak into your beautiful family life is so inspiring and I thank you so very much for sharing with us. May God continue to bless you and your beautiful family! This project is awesome and it is kicking my bum as well! Sadly, I realize it has been a long time since I have done such a project with my kiddos! 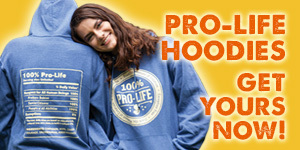 I cannot imagine how long it took you to design this. What gifts you have been given! Grateful to have come across all your excellent ideas! Thank you very much for sharing your hard work! Thank you so much. I will be using some of this with my Religious Ed class! What a wonderful collection you have put together! And, we are so lucky that you are sharing! I hope you and your family had a blessed Easter. Thank you for everything! 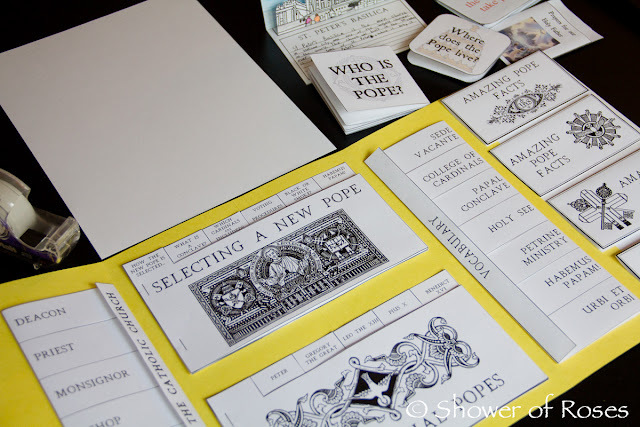 I really want to put together our beautiful Papal lapbook, but have been waiting to see if you added an fill in the blanks for your later units (like the large flapped book with Pope Francis on the front)? It's all sitting and waiting? Is there a place that you've downloaded these later additions where I can find them? I love all you do. Thank you again. I downloaded all your book lists and have been pouring over them for your American History and Serendipity's and am soooooooo excited for new year!!! Thanks! Hello Lauren, I'm sorry but I never did make a fill in the blank for the Pope Francis book. My older children completed their mini-books on there own and I still haven't finished the Pope Francis book with my little ones. We are working on it today! :) It may be too late, but I will be sure to share any additional documents I create, if I make any. Thank you, Jessica, for being a wonderful example to mothers everywhere, and for being so generous with your ideas. I look at your blog daily, and I can't begin to tell you the positive influence you have on me. Thank you and God bless you for posting this lapbook to share. I also wanted to add a special thanks for offering your ideas and worksheets for free. My husband and 3 children just moved back in with my inlaws because of our financial situation, and blogs like this mean so much to me....to be able to continue to teach our children their Catholic faith in an Episcopalian home....it's so hard sometimes. But words can't express how grateful I am to you, for your hard work and love that go into running a blog like this. May the Blessed Trinity give you all the graces you need to continue His work on earth!